FutureLearn, the social learning platform, was among the 20 fastest-growing, most innovative start-ups transforming the future of learning and work, to receive an award on the night. FutureLearn – Based in the UK, a leading social learning platform that uses design, technology and partnerships to create enjoyable, credible and flexible online courses and postgraduate degrees that improve working lives. Lobster Ink – Switzerland-based, proprietary learning methodology combines the best of cognitive understanding, video techniques and behavioural science to deliver practical training on skills, knowledge and behaviour. Yixue Education – From China, A company focused on adaptive learning, Yixue has developed an AI-enabled system to divide knowledge into small tailor-made chunks, so students can focus on their weaknesses instead of wasting time on what they have already mastered. “Participation for this year’s awards was the highest yet with 182 applications from 30 countries showcasing the best and brightest companies in the global learning industry. The winners were chosen for innovation, market impact and growth potential of their start-up. We were impressed by all entries and how they highlight the impressive work being done by entrepreneurs transforming education at a global scale,” shared Benjamin Vedrenne-Cloquet, Co-founder of EdTechXGlobal. The EdTechXGlobal All Stars Awards is determined by a global panel of judges, evaluating various factors including revenue growth, scale, innovation and market impact. For each category, the awards showcase the top three start-ups across segmentation, geography and industry trends. The winners received prizes to enable the continued growth of their companies from the partners of the EdTechXGlobal All Stars awards, including Amazon Web Services EdStart, boutique technology-focused law firm Kemp Little, and specialist investment and corporate advisory group IBIS Capital. 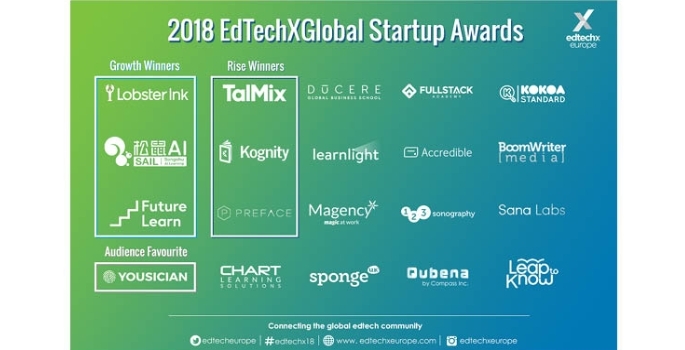 The awards took place during the annual EdTechXEurope summit, where 850+ thought leaders from 50+ countries joined more than 135 speakers to explore the ideas, innovations and technologies enabling a future where we are all ‘Eternally Learning’. For full details of the EdTechXGlobal All Stars Awards competition and the event visit: http://ecosystem.edtechxeurope.com/2018-edtech-startup-award-winners.